At the end of this morning's keynote at IDF 2010, Intel announced the Atom Processor E600 series. It's a Moorestown-like SoC designed for embedded applications. 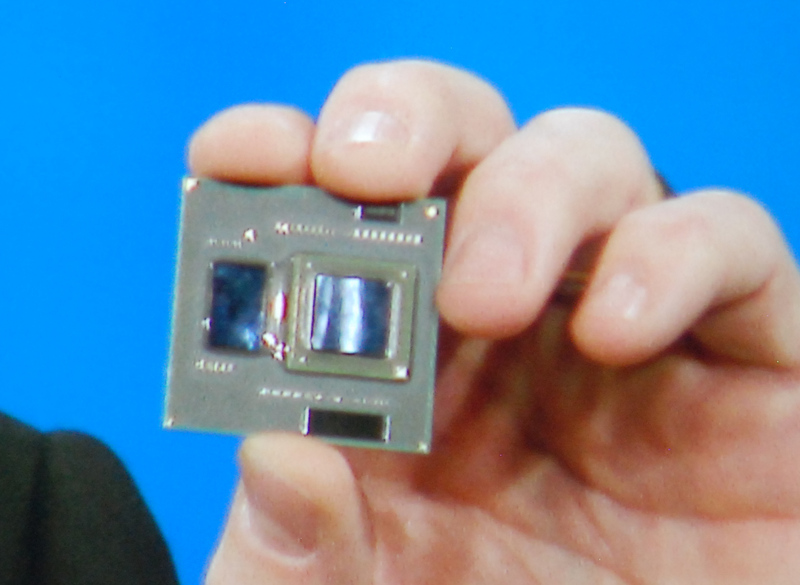 Intel is really targeting this SoC at the consumer electronics industry and a variety of applications that could benefit from both better integration. Demonstrations included an E600 SoC powering a car navigation system and a variety of dynamic 3D content or video on a separate passenger entertainment display. You can see it running a PowerVR graphics demo if you look closely in the photo below. E600 brings everything onboard for the platform, including PCI-E for using the E600 in a multitude of different capacities. 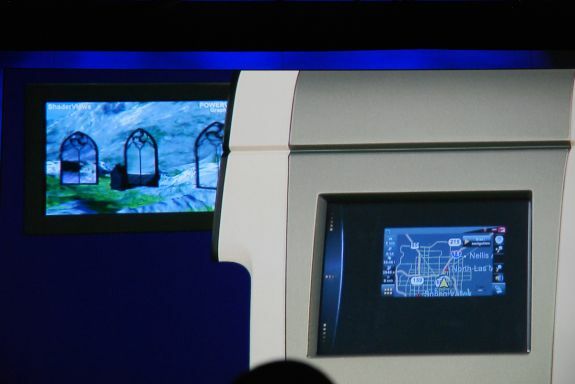 Either bring your own PCH or build one yourself - Intel already showed examples of Realtek, OKI, and ST Microelectronics on stage. If you're just building a desktop, Intel has a fairly standard platform controller hub called the EG20T for control like ethernet, SATA and USB. 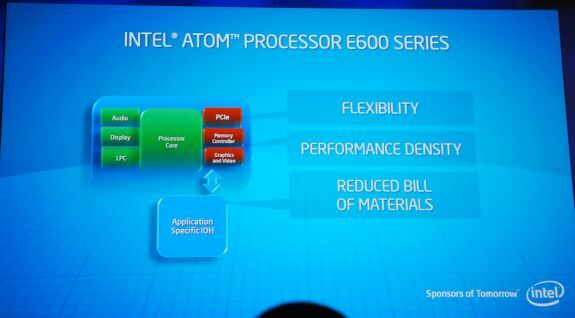 Intel really hopes that their embedded Atom platform will bring cost of system integration way down. The E-series is a 45 nm part, 32nm and 22nm Atom series parts will follow. When designing a microprocessor you have two options. For very complex designs you have a bunch of engineers come up with an architecture. They then spend countless hours, days, months, eons designing it, and doing layout and performance optimization. Photolithographic masks are made and handed off to a fab that produces the silicon on wafers. This is a great approach for microprocessors that have high complexity, performance and volume demands. If you have a simpler design and want to get it to market cheaper, there's another option: a FPGA. A field programmable gate array is exactly what it sounds like, a whole bunch of gates on a die that can be programmed in the field. An FPGA can be made to function like pretty much whatever microprocessor design you program it to be. You shave off the initial manufacturing costs as you don't need to make expensive masks. FPGAs are often used in emulating larger microprocessor designs. 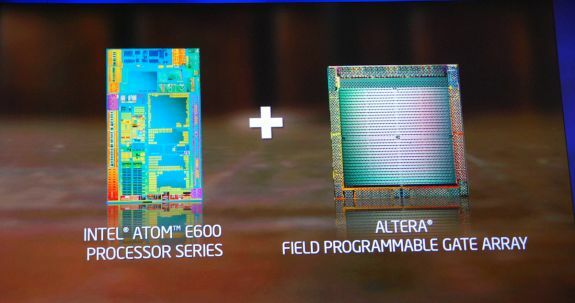 As Intel tries to take the Atom into the embedded space it may run into some customers that want to pair Atom with custom hardware. Intel could simply make a version of Atom for every single market vertical, however that would incur a significant cost overhead. Instead, in the first half of 2011 Intel will introduce the Stellarton processor. It's a configurable Intel Atom processor with an on-package Altera FPGA. This would be a fun processor to have on a beagle board or other embedded dev system *(arduino). SoC = System on a chip? There's a reference made to this (EG20T) in the text of the article. I can honestly say that I don't know too much about the FPGA. FPGAs can be used for all sorts of things. Think of it as a blank peice of silicon that you can program whatever hardware you want onto. Need additional USB controllers? Put that in there. Need a second video card output? put that on there? Need a 10MHz reference oscillator to sync a bus with? put that on there. Need to add a CAN bus, I2C bus, or Dallas 1-wire? put that on there. Raid controller? ditto. Obviously there are trade offs. FPGAs can't hold a huge amount of hardware because they can be programmed with whatever hardware you need at the time. Another problem with them is that they eat power for lunch. The plus side though is that you're able to bypass the limitation that you have with standard hardware which is what you buy is what you get. With an FPGA, if you have a memory controller for example, you might start out with one that works well, but if the manufacturer finds a bug in the controller that causes it break if it sees a certain pattern in the data, they could issue a new version of the controller that you would apply as a patch. Bug gone.